In 1998, the addition of Blum® Hardware to Alpine’s product line was a perfect complement to the hardwood plywood and other panels that we were already taking to our customers. Blum is a leading manufacturer of functional hardware for kitchen cabinets. 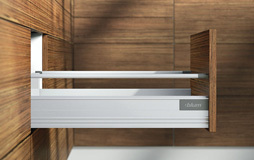 BLUM specializes in concealed hinges, lift systems, drawer runner systems, and organization solutions for drawers. Whether you are talking about CLIP, tool-free assembly, smooth running action, the use of storage space, BLUMOTION with its silent and effortless motion or the SERVO-DRIVE opening support system innovations from Blum are seen as milestones in the furniture manufacturing industry. BLUM places the focus on kitchen users and their needs in everything that is developed and manufactured. Blum products help our customers increase their productivity, save time and add value to their kitchens through high functionality. Whether you are a consumer, cabinet maker or architect, BLUM has product to fit your project needs. 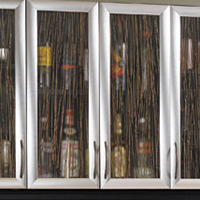 Explore the possibilities with the BLUM product portfolio. A selection of products for the design of interior casework, furnishings and surfaces in commercial and residential applications. Element Designs the premier custom manufacturer of innovative, high quality products including aluminum frame cabinet doors, PARAPAN solid surface doors, sliding door systems, eluma LED illuminated shelving, backsplashes and architectural panels. MICORE 300 Mineral Fiber Board is a versatile, high-performance fiber baord that handles easier than gypsum, is used to produce fabric and vinyl-covered wall panels, office dividers and tackboards. Wind Mill Slatwall Products give you endless possibilities for product display. Specialty Laminate Related Products include Wilsonart edgebanding, SeamFil laminate repair and FormFill Caulk and laminate repair.